What is Body Music? Before people were hollowing logs and slapping rocks, they were using their bodies to stomp, clap, sing, snap and grunt their musical ideas. There are many traditional Body Musics in the world, from African-American Hambone and Flamenco Palmas to Sumatran Saman and Ethiopian Armpit music. Keith Terry has developed a contemporary style of Body Music based on his training as a jazz drummer, as well as his years of intensive study and collaboration with world rhythmic systems. Body Music: Part Two uses the techniques developed in Part One to create more complex rhythmic patterns, as well as increased coordination between hands, feet and voice. Working at an intermediate level, students explore sequencing, phasing, downbeat/offbeat and syncopation while building a four-part polyrhythm. With Evie Ladin, Namita Kapoor and Yari Mander. 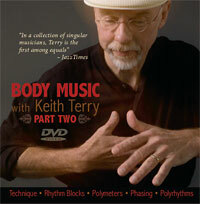 Includes Footage of Keith Terry in Performance. Sophisticated and up-to-the-minute in its intellectual appeal, in its multicultural inspirations and in its blending of boundaries between art forms.